Mandarin who travelled in the Keying, first Chinese junk to ever sail from Hong Kong to New York and further to London. Portrait drawing of Hesing. 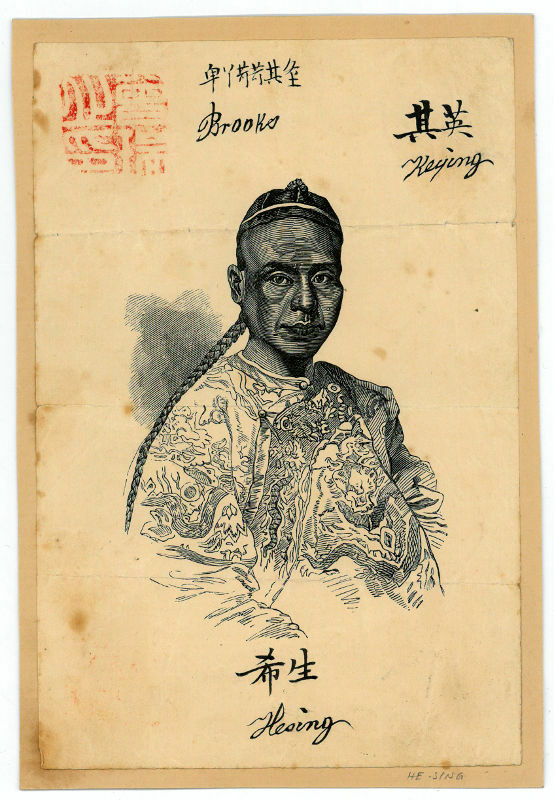 Signed ("Hesing") in bold black ink at the foot beneath his portrait, also adding the junk name "Keying" and "Brooks" to the head, all with their equivalent Chinese characters beneath. [Blackwall. 8vo. Mounted on cardboard. One addenda (see below). The drawing bears to the upper corner a red ink stamp with Chinese characters, being the seal of Prince Hui Rui. The document has been affixed to a slightly larger card. - Few stains not affecting the signatures. Small folding and creasing. 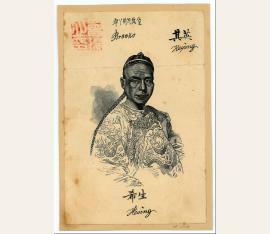 - Together with a colourful visiting card, with Hesing signature, beneath his name in Chinese characters and alongside a Chinese ink red stamp, being the seal of Prince Hui Rui. The card has been affixed to a slightly larger card with a typed annotation "Signature of a Chinaman written on board the Chinese junk at Blackwall, June 20th, 1848". - With heavy folding. - The Keying was a three-masted Chinese trading junk that sailed from Hong Kong in December 1846 with a mixed crew of Chinese and British sailors. The vessel had been purchased surreptitiously by a conglomerate of enterprising English businessmen. It was placed under the command of Captain Kellett with the intention of carrying curiosities and merchandise to England and thereafter serving as a kind of floating museum. The Chinese crew members that they were embarking on such an extended journey were not aware of such plans. The Keying arrived in New York City on July 9, 1847, creating a sensation, with seven thousand visitors per day. - In late March 1848, the Keying arrived in London to great fanfare, and several different medals were struck to commemorate its appearance, including one that had a bust of Madarin Hesing. It was visited by the Queen Victoria, whose right to be the first European woman to visit it was reserved, The Duke of Wellington and Charles Dickens. - It has been suggested that the Chinese Emperor was aware of the project from the start and secretly kept informed about it, and that the mandarin served as an informer to report back in detail..